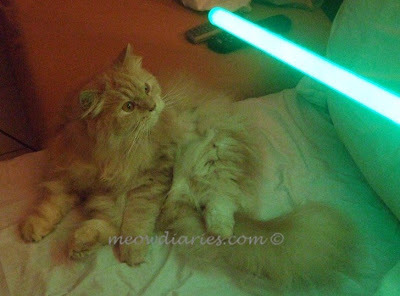 I hear Master's friend Shemah is curious about B's lightsaber so I posted this picture for her. This is Uncle Hans by the way. He is B's best bud and he claims I am his favourite cat! Since I'm his favourite, I hope Uncle Hans won't get mad with me for posting his picture here! He did say yes to Master when she asked his permission to have his pic at her blog, but that was months ago. meow! 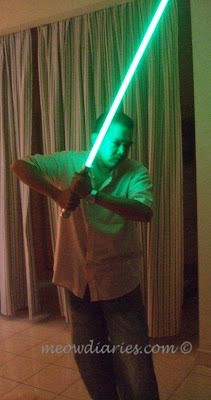 B got this really cool Master Replica lightsaber when visiting Tokyo several years ago. Poor Master was left behind then but we kept her company while B was away. B loves playing with his lightsaber, which is a replica of the one Luke Skywalker used in Return of the Jedi. I think it's really cool and it looks like the real thing with sound effects and everything! Wah.. this looks really awesome GP.. got sound and all eh? wah i like.. and so worth the price lah!!! Meow meow Monica! 8 points edi! Hm.. can I have CT here GP.thanks dearie! Wah.. how to catch up with Mon like this.. lol! i missed the saber chop!!!! I think so too Monica, and it’s huge la! :'( :'( :'( :'( :'( :'( more sad is the fact that I WANT ONE!!!!! Ohhh wowwwww!!! I'm so jealous of B, marzie!! "Uncle Hans" looks super cool with that light saber!! Recent blog post: Taylor Lautner Talks About “New Moon”, Jacob Black and Girls!! LOL @ Jabba the cat!! hahahaha Tell B i am making Chewie noises just looking at the Light SabeR!! LOL! hahaha look at Benji...so cute! Welcome Monica, thanks for chopping! LOL! Debbs 10 points LJ! U can’t drop at my blog for ex Mon? I am edi logged in since last night so can drop but cant change acct like LJ. I cant log in at all Mariuca... what is for ex?? Sorry to menyampuk aahh! :) But I can login to my EC and drop no problem..
but i am using the EC toolbar. Ehhhhhh u can login and switch Shemah? I don have ec toolbar. i oso don have ec toolbar.. I don wan to install ec toolbar la..
LOL short form miskomunikasi Mon ha ha! hahahahahha yalor!! i kept thinking what for ex?! LOL! is it becoz of it will slow down yr lappie? And also cause it slowed down my lappy, yes Mon! Exactly, so we cant view our yest droppers from the toolbar, so I didn like it la.. and quickly removed lol! He he thank you Aunty Jean! Meow! Biasa la Benji selalu mata besar nampak mcm terperanjat gitu he he!